Meet your driver and tour leader at your hotel in Rome or in Piazza Bar- berini ( meting point). 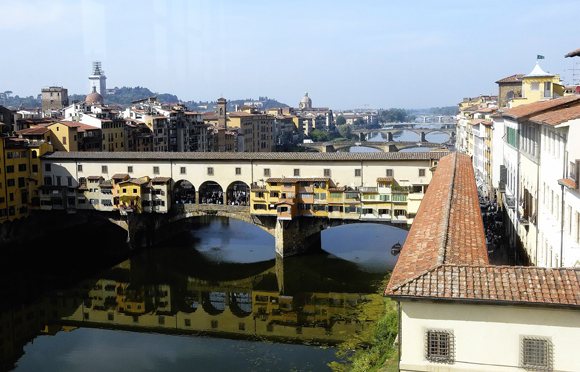 Transfer to Florence with two en route stops to enjoy the best of Tus- cany: Siena (guided visit) & San Gimignano (free time). The drive itself is a magnificent path along the roads of Tuscany, where it is possible to enjoy the view of hills covered by vineyards, olives tree, small villages and original bell towers. The first stop is Siena, probably Italy’s loveliest medieval city, for a walking tour with a local guide. Siena’s heart is Il Campo or Campo’s square, where the famous horse race Il Palio takes place two times each summer. The town offers mag- nificent masterpieces and incredible views. Enjoy a wine tasting with cheese and salami. Continue to Florence and en route stop in San Gimignano. The town is listed as a World Heritage site and fascinates for its medieval look. Its high towers create a unique skyline. Enjoy the village on your own. Arrival in Florence late afternoon. Free time for dinner. Overnight in Florence. The day is free at leisure. There are many optional tours available: Pisa with its leaning tower, Montepucliano and Montalcino, Cortona, Assisi and Perigia and many other. In the late afternoon, transfer to Chianti area for a unique experience. Enjoy the view of the beautiful hills cov- ered by vineyards and have a fantastic dinner in a farm house, accom- panied with Chianti wine. Return late evening at hotel. Overnight in Florence. After breakfast, meet your expert driver guide and continue to Pisa. Here, meet you local guide and visit the city. Pisa is most famous for its Leaning Tower, but the old Maritime Republic offers incredible sights like Miracles’ square, the beautiful Battistero and many other masterpieces. At the end of the excursion, proceed to Cortona, where you will spend the next 2 nights. Dinner will be served in a typical restaurant. Overnight in Cortona. After breakfast, start your unforgettable cooking experience in Cortona with your local expert. Cortona is a small charming town in the Valdichi- ana, in southern Tuscany. The city, enclosed by stone walls dating back to Etruscan and Roman times, sits on the top of a hill about 600 meters above sea level. This dominant position over the valley offers a spectac- ular view from all over the town of the surrounding valley and even Lake Trasimeno. IN the morning, you will have the possibility to visit the fresh market to learn about the local ingredients, then you will have an excit- ing cooking class to learn the secrets of Tuscan cuisine. Then, you will eat what you have prepared with your own hands. The afternoon on is free. Overnight in Cortona. In the morning meet your driver guide and proceed to Assisi, where you will have free time to discover the town. Continue to Perugia. Your lunch will be served in a nice farm house in the countryside. Upon arrival in Perugia, meet your guide for a visit. At the end, continue to Rome. Your dinner will be served at hotel. From €1823, per person, based on double occupancy. Single room packagefrom €225 .